It is a smartly devised 2-in-1 retractable leash plus collar for pet dogs with patented magnetic clip to have a strong grip and complete control. Launched as the ultimate leash for pet dogs having the smartest features and advantages, Lucky Leash may be just what will transform the way you venture out with your pet anywhere anytime. Pet owners naturally look for good quality products that are durable and do not cause discomfort to them. Lucky Leash claims it guarantees you all that and more. Being compact, lightweight and flexible, it’s easy to attach it. In addition, it fits into your pet’s collar and can be pulled out whenever you need so you don’t have to worry about getting misplaced. Its patented magnetic grip ensures its handle stays in place securely. 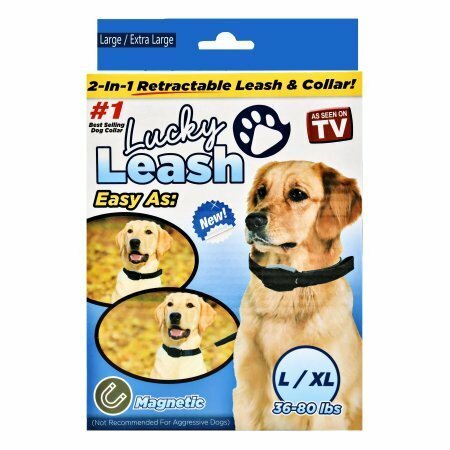 Lucky Leash is made of sturdy material, which ensures its durability and optimal use for you. Further, you can select either a collar or harness design to use this leash. Lucky Leash is perfect for those who enjoy an active life outside as it guarantees safety and also fun times every moment. Be the first to comment on "Lucky Leash REVIEW"